Scotland's Greig Laidlaw has consulted a sports psychologist in a bid to take some of the emotion out of his game. The scrum-half will captain the Scots at the World Cup and feels consulting professionals about his mindset on the pitch can improve his performances. "I've spoken to a few people," said Gloucester's Laidlaw, 29. "I'm one that sometimes gets wrapped up in emotion. I love playing for Scotland but if you look back now in the past you might have overdone it." And he added: "It's not that you feel less for playing for the country but if I can take some emotion away and put more into my performance then ultimately that's better for Scotland." Despite the World Cup beginning on Friday when England take on Fiji, Vern Cotter's Scotland only play their first match in the tournament next Wednesday against Japan. And the Scotland skipper is aiming to right the wrongs of previous World Cup campaigns for the national side. "There's been false dawns before in Scottish rugby and not coming up to the plate when it mattered," he explained. "This team will be judged on results. We're going to work extremely hard to get the best possible results. If we do that we believe we can cause teams problems." 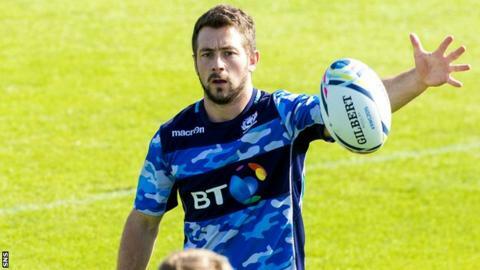 While this will be Laidlaw's first World Cup he is very familiar with his new surroundings at Scotland's base in Gloucester, where they will also play their opening Pool B fixture. And he feels it's to his advantage. "It's good especially if you're a goal kicker," said Laidlaw. "To kick at grounds that you've kicked at before makes you comfortable. I saw the pitch a couple of weeks ago and it looks tremendous. I'm looking forward to playing there."